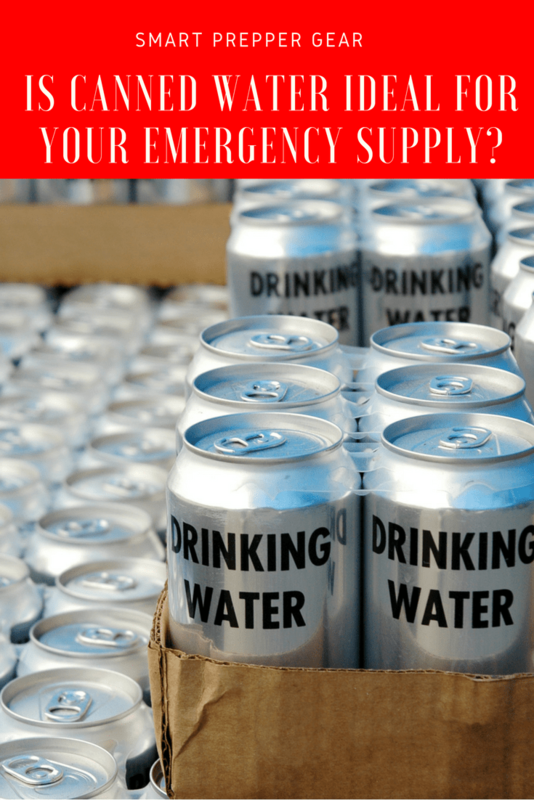 Home » Preparedness Planning » Is Canned Water Ideal for Your Emergency Supply? Typically when you think of emergency water supply you think of storing it in plastic bottles and jugs. Canned water doesn’t even cross your mind. When I think of canned beverages I think of craft beer and sodas…No, I’m not a hipster. 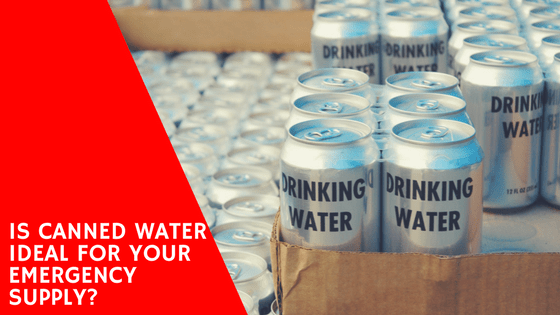 As I began to build my prepper water storage supply I began to hear about canned water. Most recently, during the hurricanes of 2017 many companies began producing them to send to victims. Most notably, Anheuser-Busch sent many cans of water to Texas, Florida and even Puerto Rico. In total Anheuser-Busch sent 410,000 cans to the victims of Hurricane Harvey in Texas. They continued to contribute to the remaining hurricanes that hit as well. This isn’t something that they just started doing. In fact, one of their breweries will pause for certain times of the year to produce emergency canned water. The canned water is then ready to dispatch when relief organizations like Red Cross request help. Canned water was originally designed by the United States Civil Defense program during World War 2. The government was looking for easier ways to send water supply to the troops. So they designed canned water. When I heard about canned water for emergency purposes I was kind of confused. You would think that water doesn’t have a shelf life. In fact, water itself doesn’t have a shelf life. However, when water is stored in plastic containers then that is when a shelf life is incorporated. This is because after about 6 months of production the plastic material begins to degrade. This pollutes the water making it unsafe to drink. One way to get around this is by storing water is BPA free food-grade containers that have a longer shelf life. These containers can typically carry 7 to 55 gallons of water. Most of us do not have the shelf space for such a container. You can buy smaller BPA free containers but the cost will add up quickly. Now yes, you can consider gathering water from local water resources in an emergency event. However, to increase your survival rate you will want to have quick access to long-term water storage. Going out to gather water after an emergency will put your safety at risk. This is why I began researching about canned water. After much consideration, I wanted to share reasons why I believe canned water is a good prep to have for emergency water storage. Then I will share some downsides of them as well. According to Blue Can Water, they filter and purify their water to 4-9 parts per million of dissolved solids. During the canning process, they pressurize them to remove all oxygen before hermetically sealing for long-term storage. The canning gives the water protection from UV light and all other possible contaminants, making the shelf life around 50 years. The water is purified, sterilized and disinfected to remove any chemicals or particles using a 12-step multi-stage process. They also incorporate a BPA free lining coat inside of the can as well. One big challenge that we come across when building an emergency water supply is space. A lot of us live in smaller homes and apartments that don’t provide much cabinet space. As a result, we are limited on how much water we can have on hand. This is why it is a good thing to have canned water for emergencies. These cans can be stacked. So you don’t lose as much space in your shelves like you do with bottled water. Bottled water typically has curved tops that make it more challenging to stack. On top of that, canned water can be placed in smaller nooks of your cabinet space. Just like bottled water, you can quickly grab canned water and go. They can easily fit in your survival bags. Just like with cabinets, you can take advantage of smaller spaces in those bags. Yes, canned water is heavier than bottled water. So I would recommend carrying bottled water in your survival bags first. However, if you are out of the bottled water then this would be the next best alternative. As I mentioned earlier, canned water can be stacked. Not only that, but you can really stack them in any location. According to Blue Can, their canned water can be stored in temperatures of 33 to 143 degrees. The heat doesn’t affect the shelf life. So if you have a garage or shed then you can store them there. Typically water that is held in bottles or jugs needs to be rotated on an annual basis. This is because the plastic degrades and pollutes the water. However, canned water has a shelf life of 30 to 50 years. Typically heat will decrease the shelf life of plastic stored bottled. With canned water, this isn’t the case. Another reason that I like canned water for emergency water storage is that it ready to drink. Just like a cold beer, you just crack the tab and it is ready to drink. With plastic jugs, you have to pour the water into a drinking container. There is no doubt that canned water is a lot more expensive than store-bought bottled water. So it isn’t really ideal for those that are on a budget. It would also slow the time that it takes to build a supply quickly. This is because you are buying less water for more money. So when you are building your prepper water storage supply you should begin with store bought water. You will want to have at least 30 days of store-bought water. Once that supply is built then you should consider buying canned water for longer-term storage. Water is already heavy. When you package that into aluminum or tin cans then the weight increases. Although canned water is portable it is heavier to carry. So it wouldn’t be recommended for survival bags that are meant to be lightweight. Canned water should really be stored to be used at home for the most part. However, if you need to bug out with your vehicle then you can easily slide these into your trunk. On top of that, they aren’t going to move around much like bottled water does. Altogether, I would say that canned water is useful for emergency water storage. However, it isn’t a prep that you want to begin buying right away when you are starting off. As I mentioned earlier, you will want to buy store bought water first. Once you have a good 30 to 90 day supply of store bought water then you should consider buying canned water. The best producer of emergency canned water that I have found has been Blue Can Water. They go through an intensive process to make sure that the water is safe to drink. Furthermore, they have a shelf life of 50 years compared to others that only have 30 years. Hopefully, this has been helpful. If you have any feedback or questions then leave your comment below. I will do my best to answer your question the best that I know how. Also, your feedback helps the community prepare for the smart way now so that we can thrive later. Previous: How Does a Solar Oven Work?